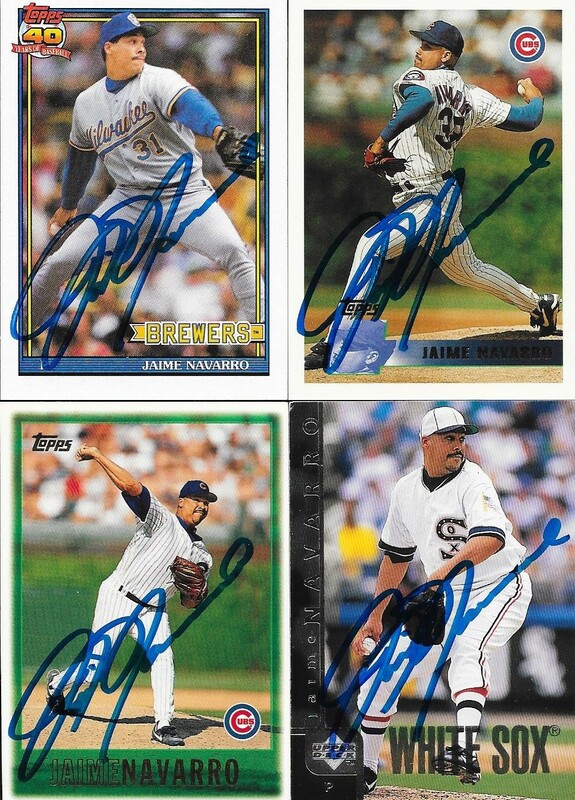 This TTM success from Jaime Navarro was a long time in the making and cost me a few stamps, but I finally got some cards back from him. 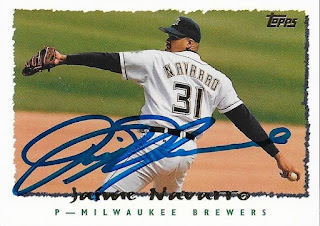 Originally, I had Navarro in my box, but was waiting to send to him once I had a confirmed success from the addresses I had seen. When I mailed to him, I got a RTS, and let those cards sit in my box again. I finally saw sme folks get returns from a new address, so I tried him again, and finally got the cards! I had so many of his cards to send, but this 1992 Studio might be the nicest one. I like the Studio design, and was glad to get this back and add it to my album. 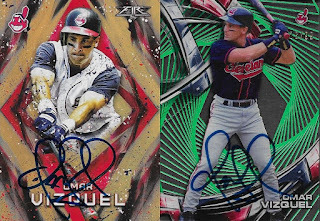 I added two 90s Topps that are grossly underrepresented in my album, 1996 and 1997. Both turned out great (96 - upper right; 97 lower left). Navarro (b. 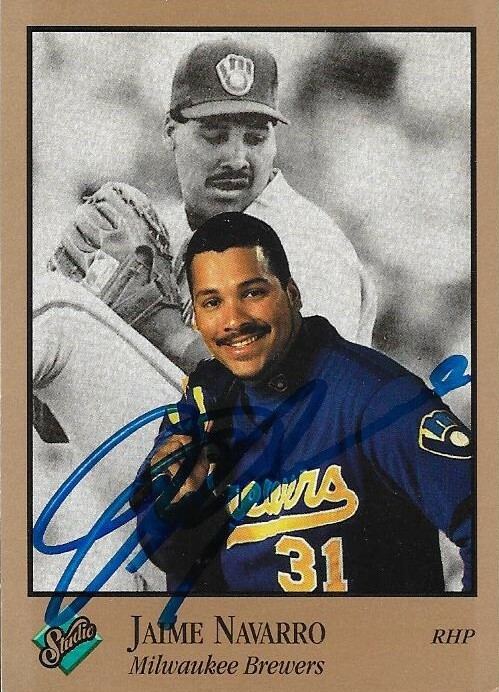 1967) played in the majors from 1989 to 2000 for the Brewers, Cubs, White Sox and Indians. 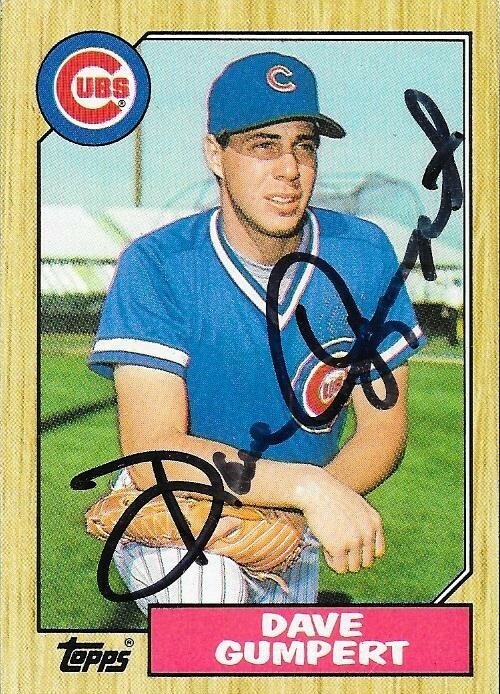 He had a career record of 116-126 with 1,113 strike outs and a 4.72 ERA. I mailed to Navarro on March 12 and got the cards back on March 21, for a 9-day TAT. 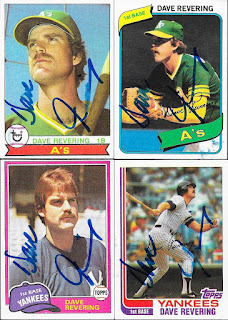 I had a whole bunch of cards of Dave Revering. So many, that I sent 7 to him for TTM. Lucky for me, I got all 7 cards back signed. 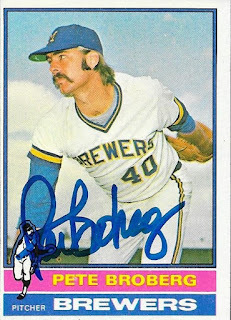 I had a run of Topps cards of him from 1978 to 1983, and added a Fleer on top of that. All of the cards turned out really well. 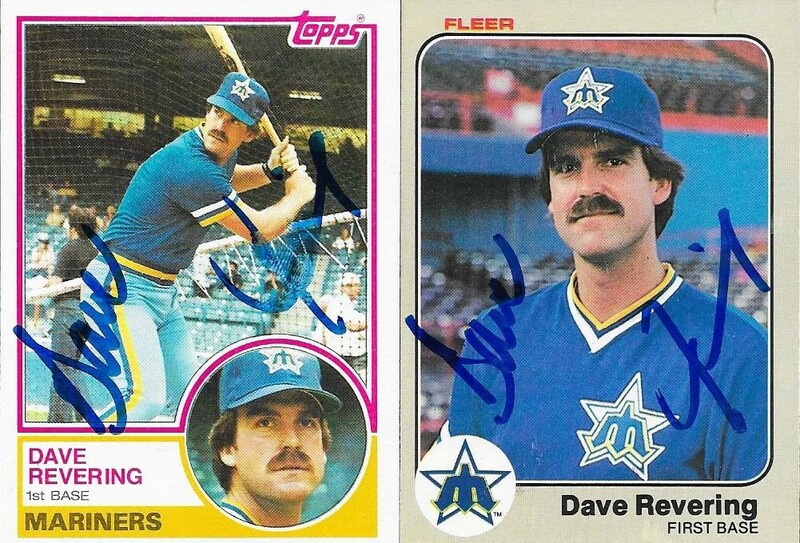 Normally, I probably would have left the 1983 Fleer (right) out, but I figured that I should go ahead and add it to my album, since I don't have many 1983 Fleer in there. The design is very simplistic, and lends itself well to being signed. Revering (b. 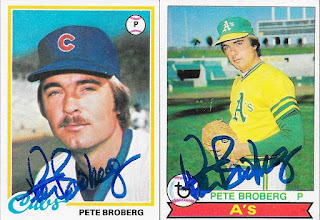 1953) played in the majors from 1978 to 1982 for the A's, Yankees, Blue Jays and Mariners. He had 486 hits, 62 home runs and a .265 batting average. I mailed to Revering on March 10 and got the cards back on March 20, for a 10-day TAT. There are TTMs I have pending that contain some nice vintage cards. I do have stuff out there that isn't for my 1987 set. One such TTM success came in recently that had a couple nice 1960s cards. 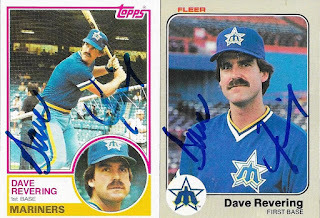 I enjoyed picking up these Dave Wickersham cards from my LCS, and turning them around for a TTM request. 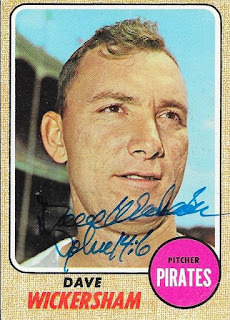 The above 1965 Topps looks really nice, I think. I also got a 1968 Topps signed. I sent him a 1967 Topps, as well, but he returned it unsigned. Wickersham (b. 1935) played in the majors from 1960 to 1969 for the A's (Kansas City), Tigers, Pirates and Royals. He had a career record of 68-57 with 638 strike outs and a 3.66 ERA. His best season landed him 30th in the AL MVP voting, due to his 19-12 record and 3.44 ERA. I mailed to Wickersham on March 12 and got the cards back on March 20, for an 8-day TAT. 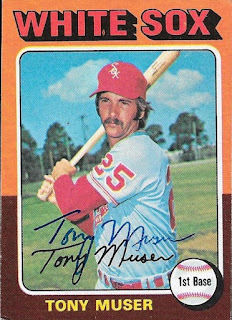 I added a former Oriole on some nice 70s Topps with this success from Tony Muser. It took a while for the cards to come in, but they were pretty nice when they did. This 1975 Topps was one that I got from my buddy, Max. I also got a 74, 76 and 77 Topps signed by Muser. Muser (b. 1947) played in the majors in 1969 and from 1971 to 1978 for the Red Sox, White Sox, Orioles and Brewers. He had 329 hits, 7 home runs and a .259 batting average. 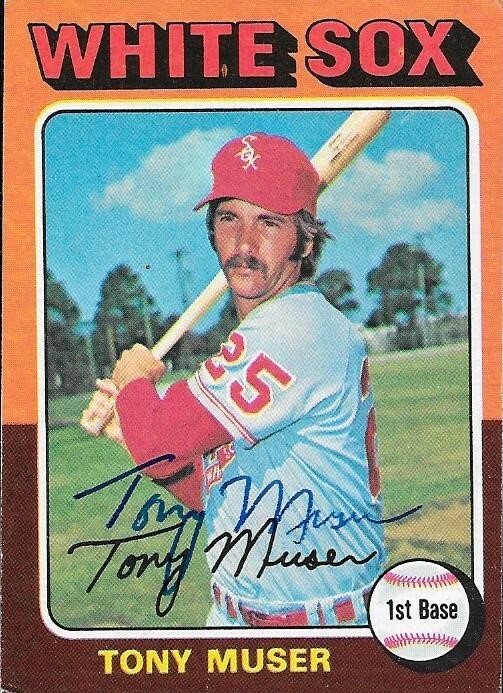 Muser managed the Royals from 1997 to 2002, to a record of 317-431 (.424%). I mailed to Muser on August 7, 2017, and got the cards back on March 20, 2018, for a 225-day TAT. 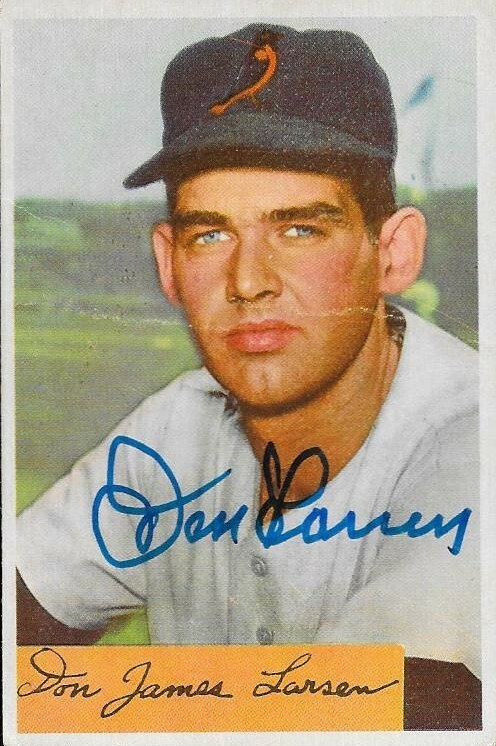 I found this 1954 Bowman rookie card of Don Larsen pretty cheaply on Ebay and figured I would send it off to have him sign it. 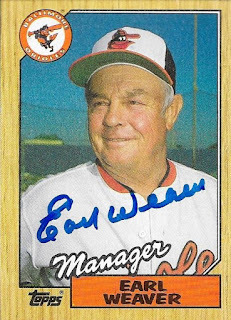 I didn't have any of his cards as an Oriole in my collection, so I thought it would be good to add this. I mailed it to Larsen on March 9 and got the card back on March 20. I paid his fee of $5.00/card. 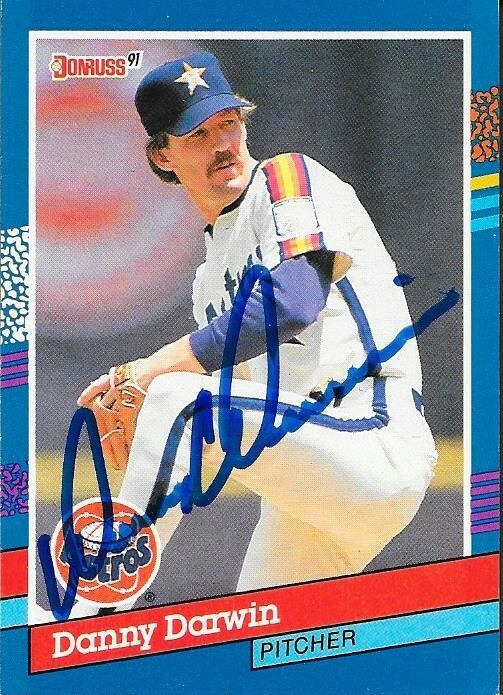 Another Hall of Famer from the 1987 Topps set was marked off of my list when I got this return back from Goose Gossage. I had sent to him before, but he didn't sign the card for me, so I sent to him again. 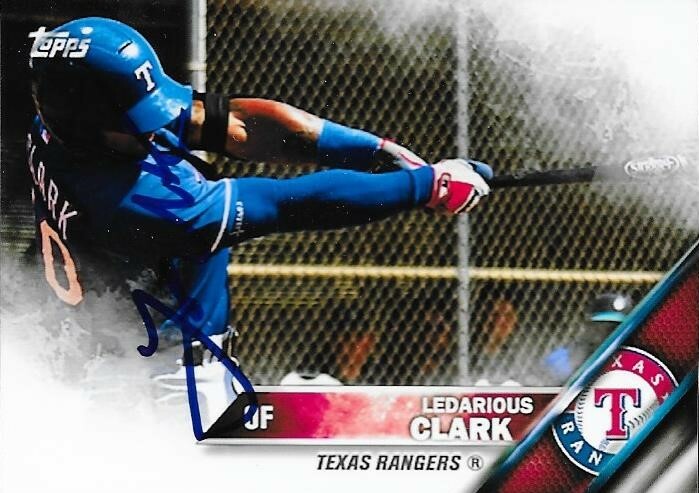 His signature looks great on the card. I mailed to Gossage on March 3 and got the card back on March 19 for a 16-day TAT. I didn't pay a fee for this one. 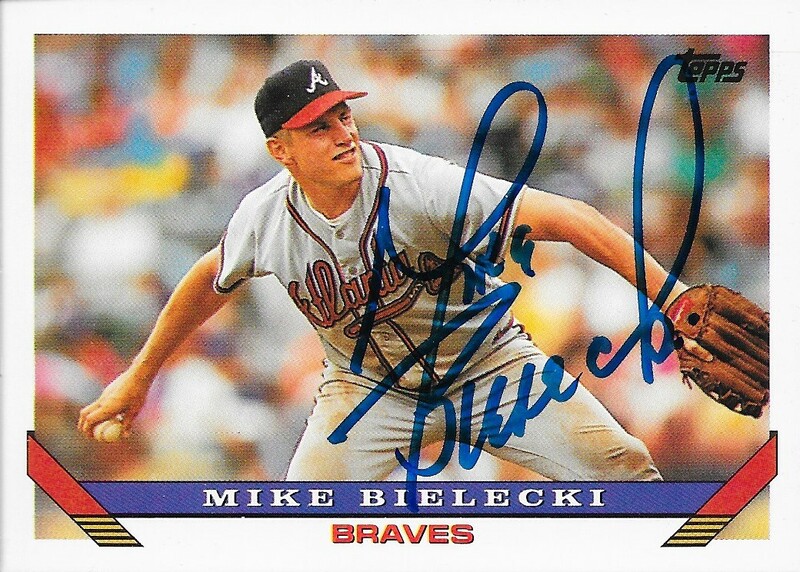 Here is a TTM success I received from former pitcher, Mike Bielecki. I got some 80s and 90s cards done by him. 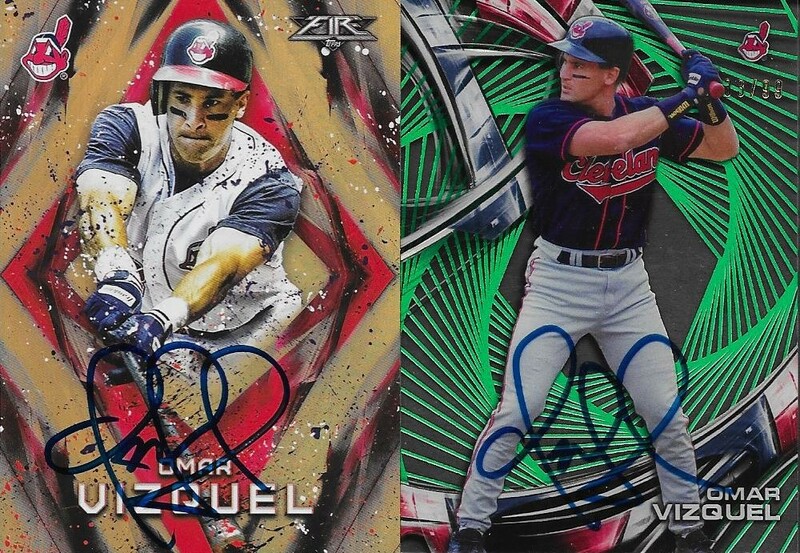 The above 1993 Topps turned out really nicely. The card being a horizontal card really helped the signature. 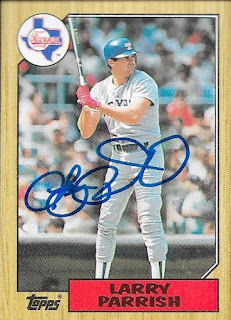 I got my 1987 taken care of with this success, and a 1986 Topps Traded. I added a few Cubs cards with these from 1989, 1990 and 1991. Bielecki (b. 1959) played in the majors from 1984 to 1997 for the Pirates, Cubs, Braves, Indians and Angels. 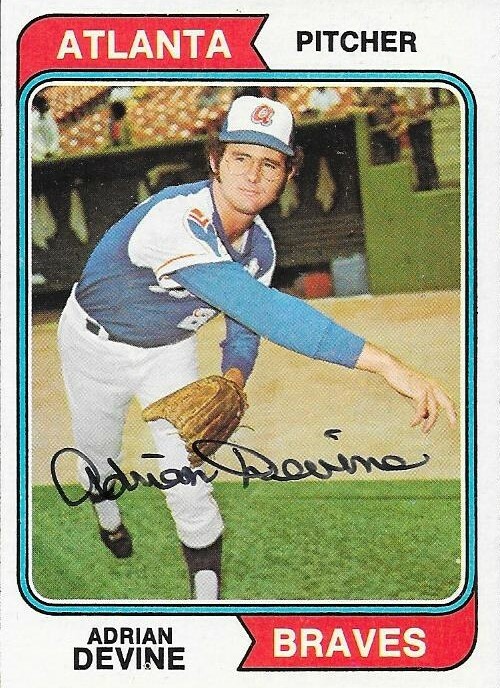 He had a career record of 70-73 with 783 strike outs and a 4.18 ERA. He finished 9th in the 1989 NL Cy Young Award voting. I mailed to Bielecki on January 11 and got the cards back on March 19, for a 67-day TAT. 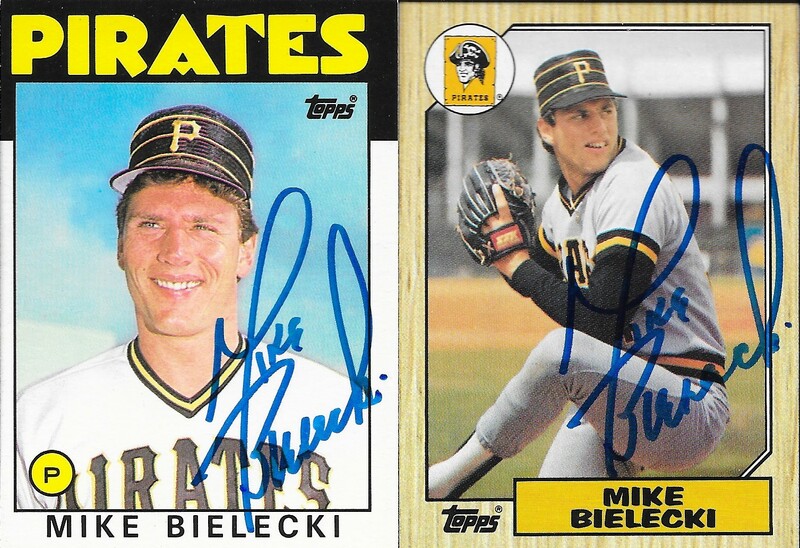 Here is another TTM success that was driven by my need for more 1987 Topps off of my checklist. 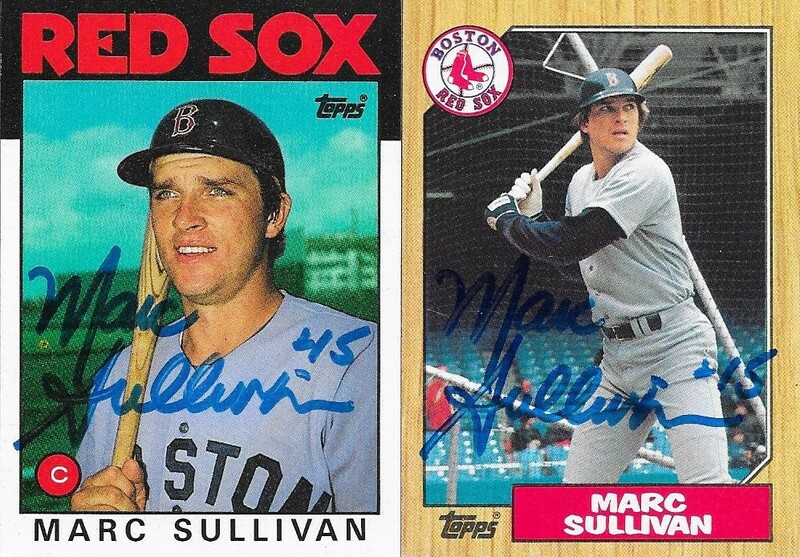 I also sent off a couple other cards in this success from Marc Sullivan. This 1986 Donruss turned out really nicely. The 86 Donruss set is a nice set, and a good design. I also got a 1986 Topps signed, along with a 1987. Sullivan (b. 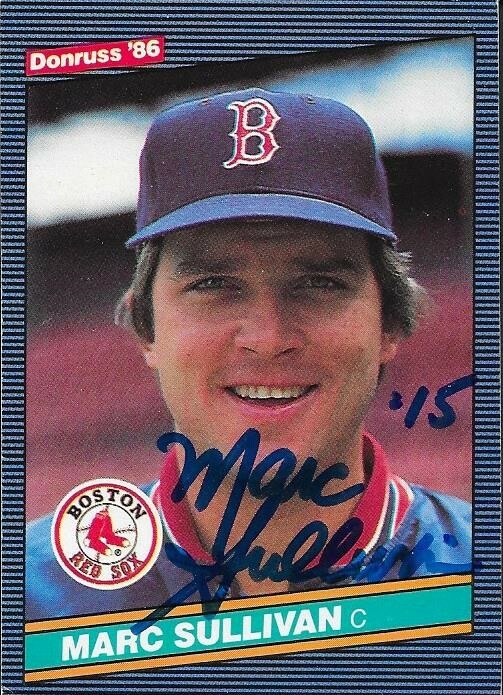 1958) played in the majors in 1982 and from 1984 to 1987 for the Red Sox. He had 67 hits, 5 home runs and a .186 batting average. 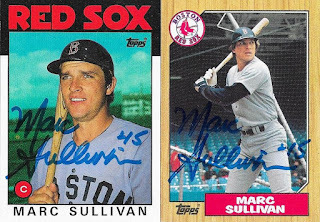 I mailed to Sullivan on February 26 and got the cards back on March 19, for a 21-day TAT. 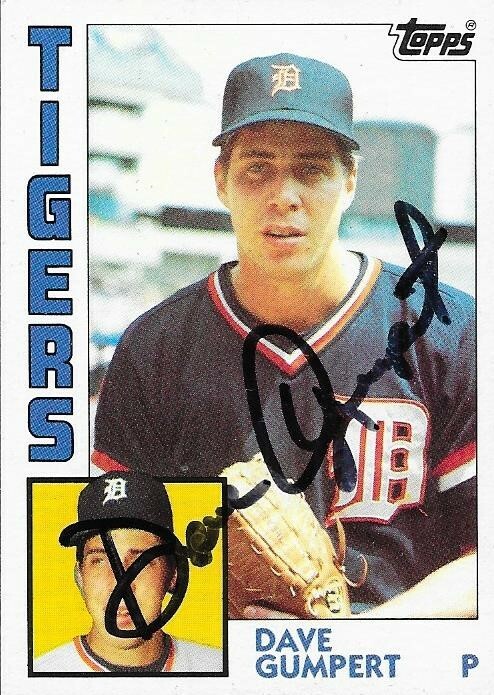 Because I missed sending him a 1987 Topps the first time I sent TTM to Danny Darwin, I had to mail to him again. I had a few other cards sitting around, so I included them in the TTM request. I probably wouldn't put a 1991 Donruss in a TTM request to anyone, but I wanted to add one to the album here. There isn't anything wrong with these cards, they just aren't usually the first choices I send along. Really, I like the design, as it reminds me of when I first got into collecting. It's very "Saved by the Bell" if you really look at it. 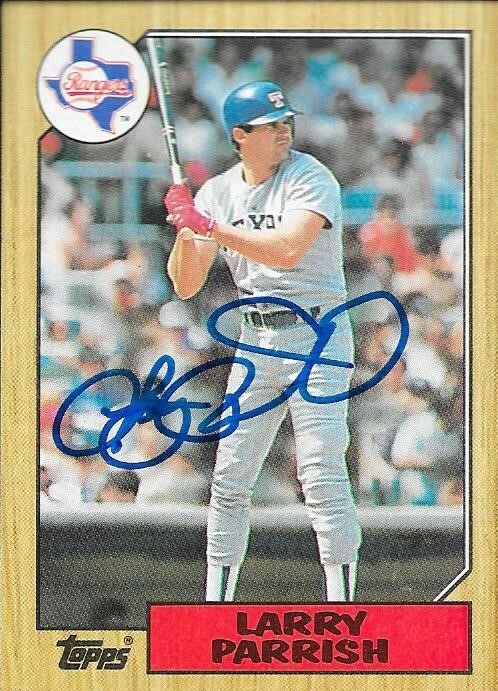 I was able to get a 1987 Topps done, as well as a checklist. I also included a 1988 Fleer since the red, white and blue design is pretty sharp. I mailed to Darwin on January 22 and got the cards back on March 17, for a 54-day TAT. Here are some more cards from the 70s, these being a TTM success from Pete Broberg. 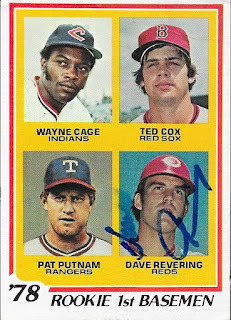 I had the 1976 Topps in my box for a while, then found a few others to send along so I could add to my Topps Autograph project. 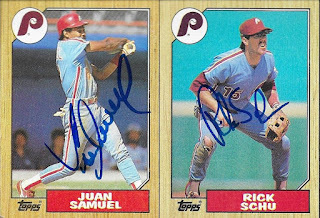 I also used a 1978 and a 1979 for his TTM request. Broberg (b. 1950) played in the majors from 1971 to 1978 for the Senators, Rangers, Brewers, Cubs and A's. 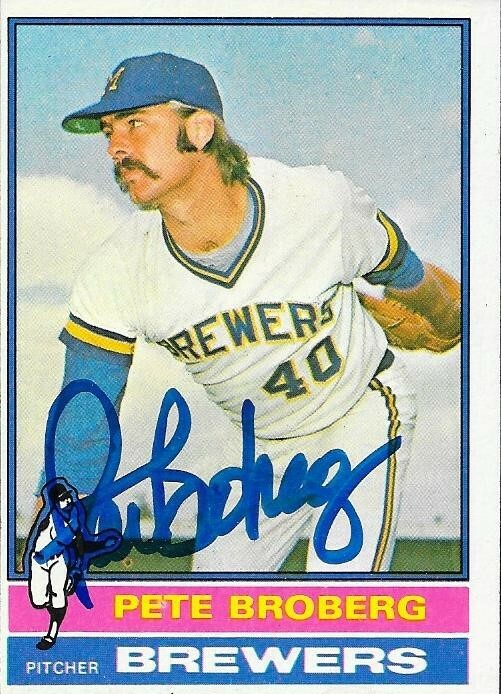 He had a career record of 41-71 with a 4.56 ERA and 536 strike outs. 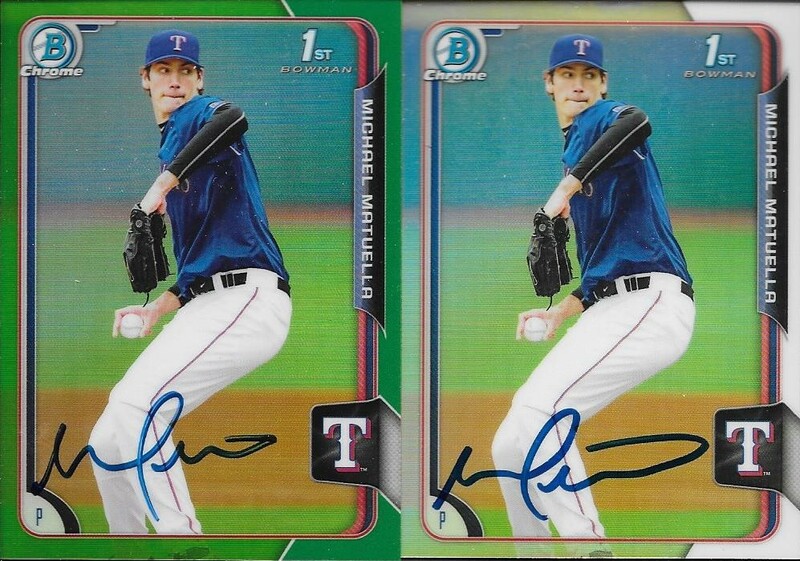 I mailed to March 5 and got the cards back on March 17, for a 12-day TAT. Most of the cards in my new album are 1987 Topps at the moment. Mainly because that's all that I have gotten in there so far. 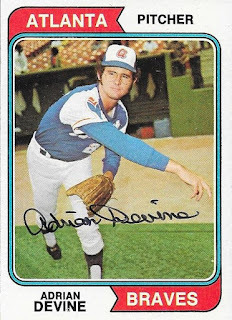 Here is a TTM success from Adrian Devine that will add a few cards from the 1970s to the album. 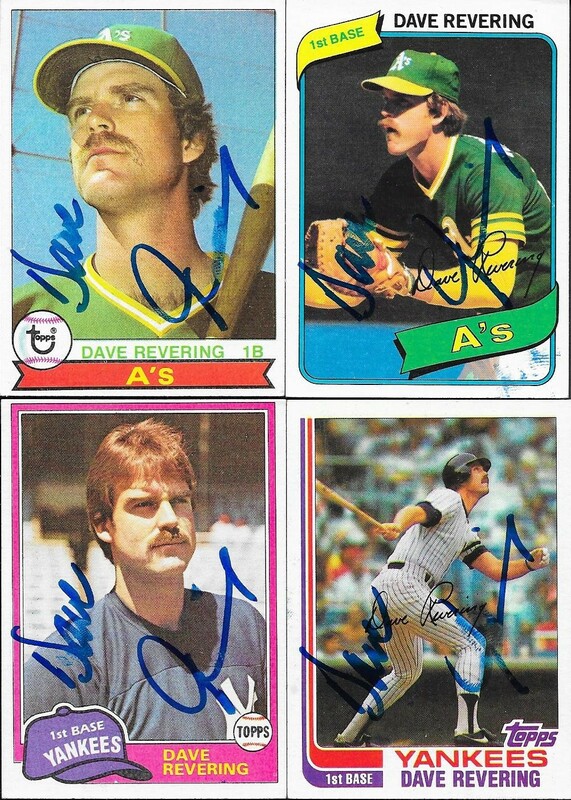 I had him sign a 1974 Topps (top), 1978 Topps (bottom left), 1979 (bottom middle) and a 1980 (bottom right). They all turned out really well, especially the 1974. Devine (b. 1951) played in the majors im 1973 and from 1975 to 1980 for the Rangers and Braves. He had a record of 26-22 with a 4.21 ERA and 194 strike outs. 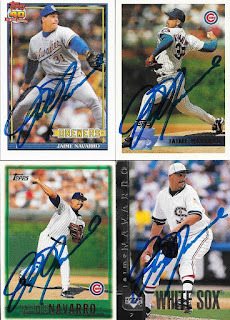 I mailed to Devine on March 10 and got the cards back on March 16, for a 6-day TAT. 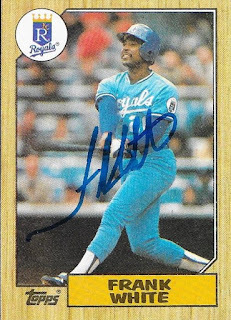 I was able to knock off two more 1987 Topps with this TTM success from Frank White. I got him through PastPros, and was really happy with the results. It'll be tough getting George Brett on this one, but it is possible. I may have to drop some money on it, but it can be had. White (b. 1950) played in the majors from 1973 to 1990 for the Royals. He had 2,006 hits, 160 home runs and a .255 batting average. He was a 5-time All Star (1978, 1979, 1981, 1982 and 1986) and won the Gold Glove Award 8 times. 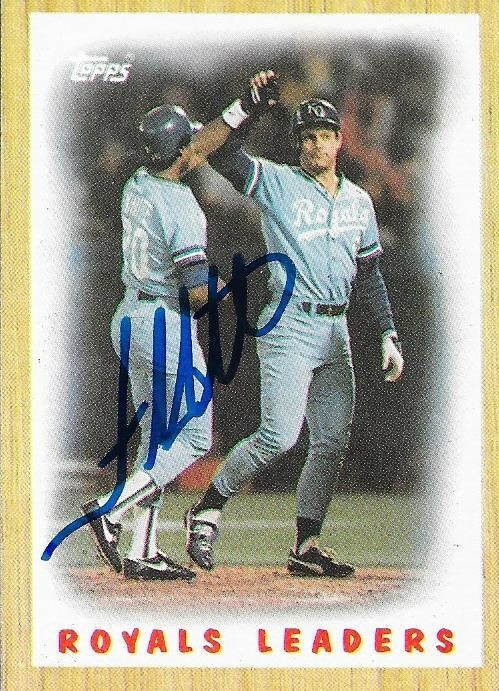 He won the World Series with the Royals in 1985. He appeared on the 1996 Hall of Fame ballot, where he received 3.8% of the vote. I mailed to White on March 7 and got the cards back on March 16, for a 9-day TAT. I paid his fee of $8/card. I'm trying to climb back into the land of the living over the last few days. I'm feeling a little better, but still not out of the woods. So, I hope this weekend can be spent getting back to normal health, and maybe get some cards cleaned up and put away. I did start a new autograph album, my 8th, which is pretty cool. I can probably fill it pretty fast with all of the TTMs I have laying around that need to be posted. This one from Dave Gumpert won't fill too many spots in the pages, but its a start. I got Gumpert on a 1984 and a 1987 Topps. I ended up with an extra 87 Topps, so I sent it along to my buddy, Max. Gumpert (b. 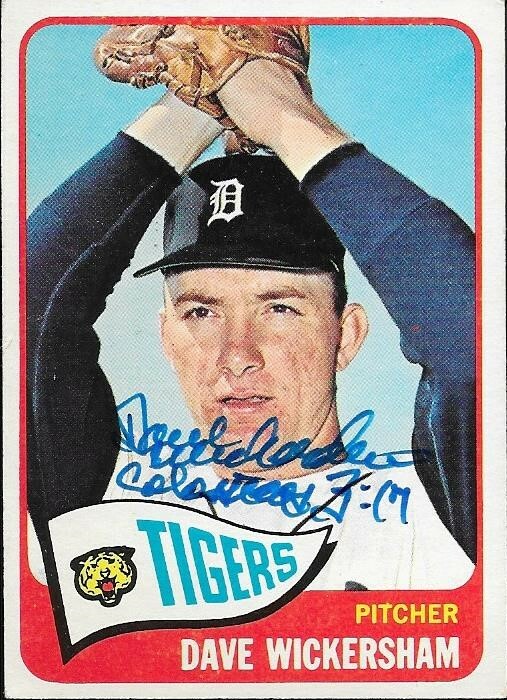 1958) played in the majors in 1982, 1983, 1985, 1986 and 1987 for the Tigers, Cubs and Royals. He had a career record of 3-2 with 76 strike outs and a 4.31 ERA. 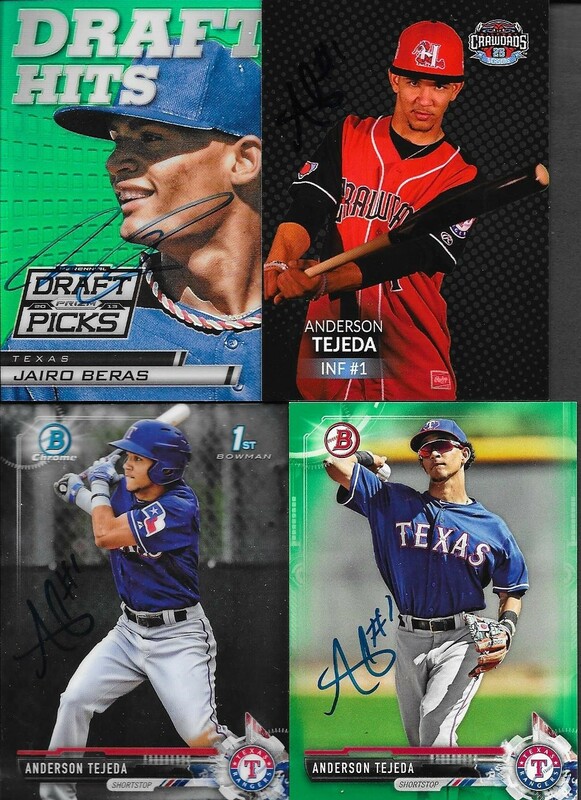 I mailed to Gumpert on March 5 and got the cards back on March 16, for an 11-dat TAT. Surprisingly, I haven't been very active in adding to my Hall of Fame signed baseball collection lately. I added a few new guys by default in January when the Hall of Fame election results were announced. Other than that, I haven't sought out anyone, and definitely haven't purchased any. When my good friend, Max, came along and asked me if I would be interested in making a deal with him for some baseballs, I listened. 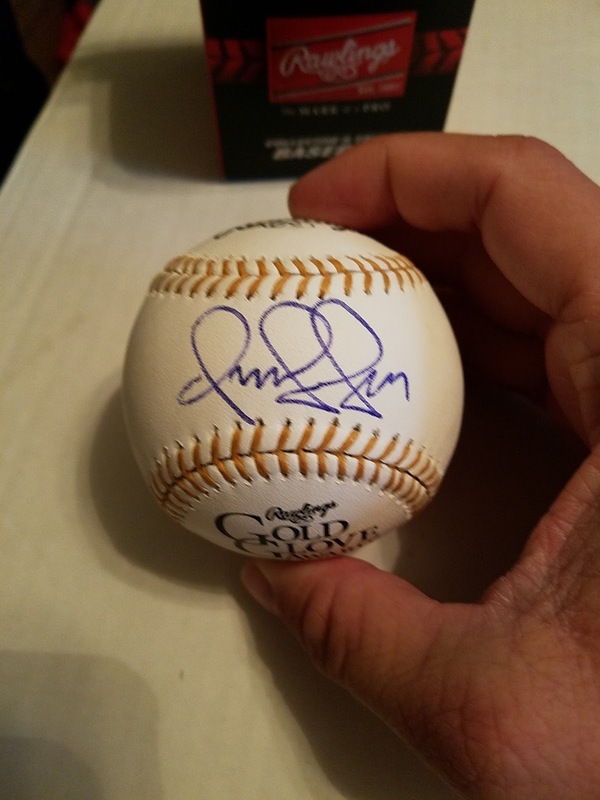 I sent him a few signed balls and in return, I landed three big names, one of which is Hall of Famer, Trevor Hoffman. Hoffman (b. 1967) played in the majors from 1993 to 2010 for the Marlins, Padres and Brewers. He had a career record of 61-75 with an ERA of 2.87 and 1,133 strike outs. His 601 career saves are second all-time (Mariano Rivera is first). He was a 7-time All Star. His best finish in the Cy Young voting was second (1998 and 2006). He was elected to the Hall of Fame in January (his third ballot) when he received 79.9% of the vote. Hoffman is now my 138th Hall of Famer on a baseball. Thanks for the deal, Max! Recently, I added a ton of 1987 Topps to my collection. The above Larry Parrish was a purchase from PastPros from their leftovers from the recent signing in Montreal. My good friend, Jacob, tried to get Parrish for me, but he wasn't able to. These three came from blog reader, Ray. He saw that I was working on the set and was kind enough to send along these three that I needed. I took some 50/50s for a guy named John on Instagram, and he sent these three that I needed. Finally, my amazing friend, Gerard, sent me these 8 cards for my set. The Dwight Evans was the biggest surprise. I was planning on getting two vouchers for him at this year's National, but now I only will need one! Thank you so much for the cards, guys! 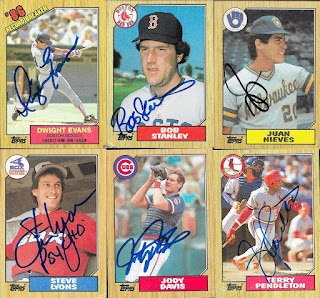 I now have 223 signed 1987 Topps out of the 792 card set. I'm a lot farther along than I thought I would be, so I feel like I am doing really well with it! I had a notification that my Ebay Bucks were available, so I took a look around on Ebay to see if I could find something to buy. I found this 1987 Topps signed by Earl Weaver, and after verifying the signature with a friend of mine who has built the signed 87 set, I picked the card up. I only paid $6.65 shipped after using my Ebay Bucks coupon. 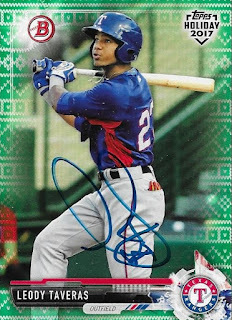 Not bad at all for a card of someone who I couldn't get to sign anymore. The deceased players will be tough, but after looking at some of the prices of some of them, they won't be too difficult. Whatever bubonic plague I was suffering from on Monday wasn't going to keep me from my goal of graphing the Winston-Salem Dash when they came to town. This is the team that I was most looking forward to seeing this season, mostly because of their manager. 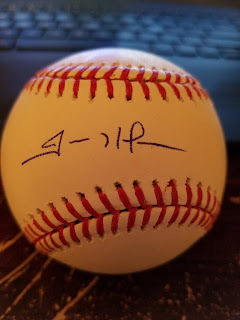 Future Hall of Famer, Omar Vizquel was named the manager of the Dash during the off-season, and I had to make sure that I got him on a baseball. Because I was pushing for the ball, I couldn't present my book for him to sign as well, but luckily, CHris made sure he signed my two best cards. I found both of these cards at the Chantilly show, and was so glad they turned out well. I had bought a pack of Steadtler pens for the Bowman Hi Tex, but they didn't get here in time. The blue Sharpie worked just fine, and I was really happy Chris thought to make sure those were the two he signed. An unexpected highlight of the night was that White Sox prospect, Gavin Sheets, wasn't in the lineup. So, while the game was going on, he had to wait by the fence to come onto the field. While he was waiting, I chatted with him for a bit about his being in Winston. He actually attended Wake Forest University, so it was a bit of a homecoming for him. Sheets was really nice, and friendly. He came back by at the end of the game and signed for us. I had gotten Dylan Cease before, when I was at Andrew's last season. He was with South Bend, and was traded. He signed 2 per for us. 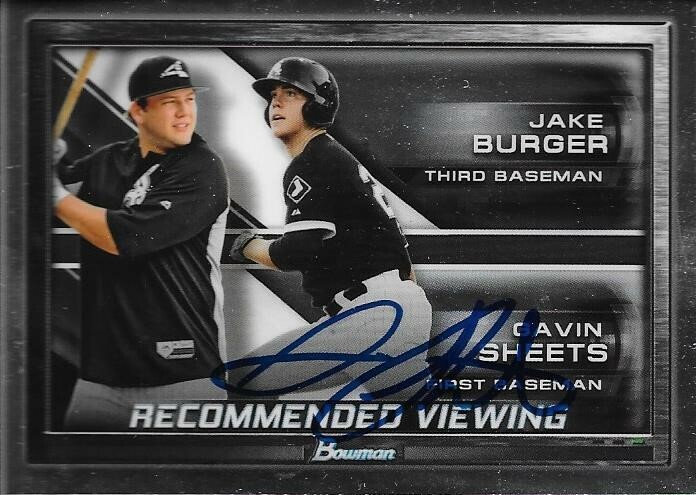 I really was glad to get a 2013 Perfect Game card out of my box. I'll be sitting on a ton of those for a while, I think. Micker Adolfo doesn't have much of a signature, but I was able to get him taken care of. 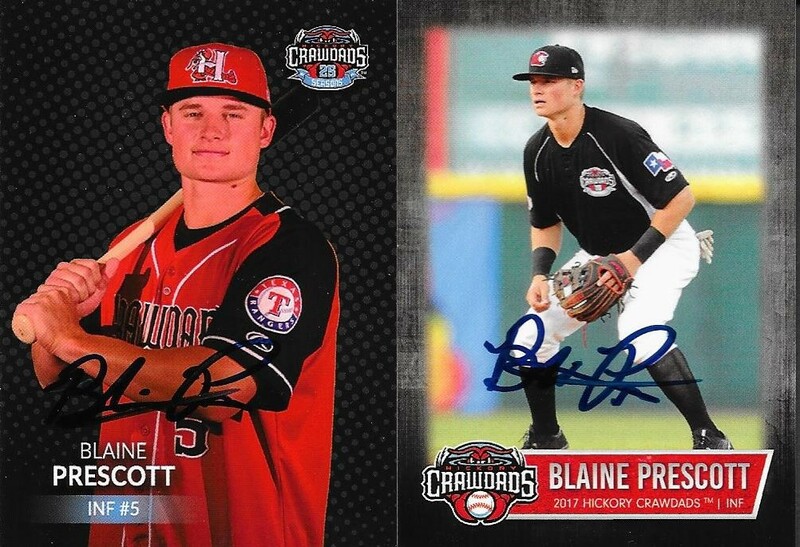 I also used up another card from my 2017 Carolina League Top Prospects set. I finished off all of the Michael Matuellas that I had, which was nice. I also took some custom cards in a 50/50, and they turned out great. This Ledarious Clark might be my favorite of the bunch. 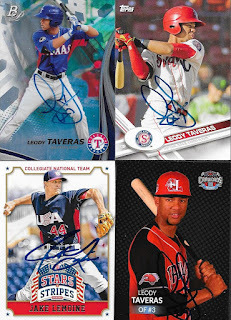 I got a good many of the customs done, but the other guy ended up with more (the guys who don't sign duplicates like Taveras). I'll have a few to work on for a while. 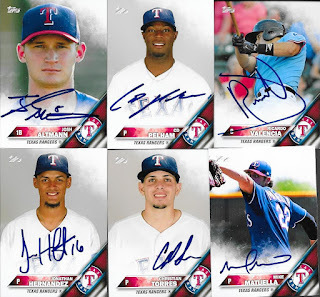 In this series, I missed out on Dane Dunning and Blake Rutherford. I wanted to catch a second game, but due to being sick, I decided I would stay home, get better and try again another time. 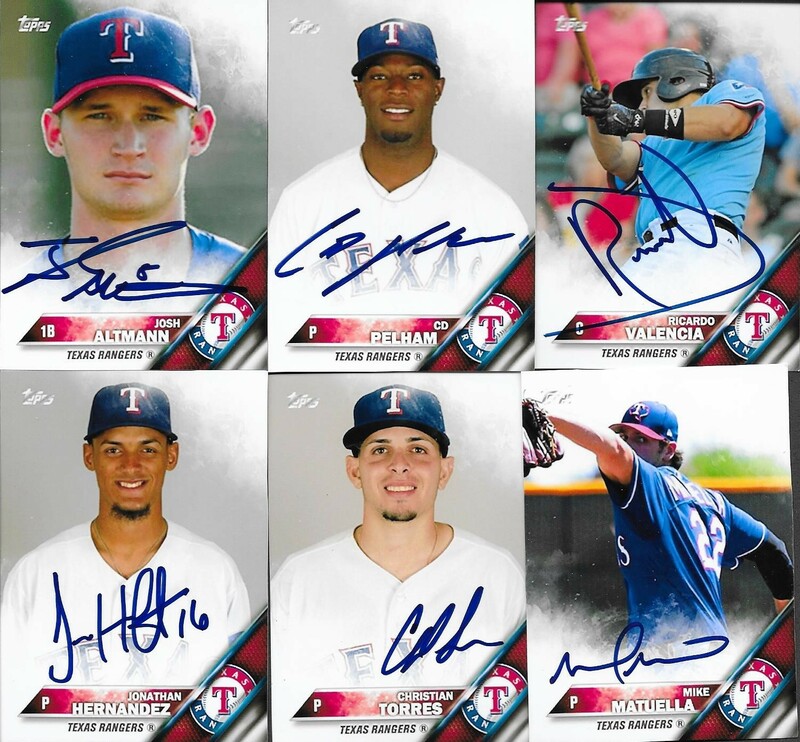 In all, I got Omar Vizquel x 2, Gavin Sheets x 5, Micker Adolfo x 4, TiQuan Forbes x 3, Luis Basabe x 4, Dylan Cease x 4, Michael Matuella x 7, Spike Owen x 2, Jonathan Hernandez x 2, Christian Torres x 2, Ledarious Clark x 2, Josh Altmann x 2, CD Pelham x 3, Anderson Tejeda x 3, Leody Taveras x 1 and Ricky Valencia x 2. And I got a Gold Glove Award ROMLB signed by Vizquel. Much like the Orioles season, my graphing season has gotten off to a rocky start. Unlike the Orioles season, however, I expect my graphing to improve. I was all gung-ho on the season starting, then winter decided that it wanted to stick around, and in turn, I have gotten really sick. I have already bypassed two games due to illness, and it has set me back a little bit on taking care of some 50/50s, and getting some stuff for myself signed. I have gotten a lot of stuff done, though, and I am fairly happy with the results so far. The above 2017 Bowman Holiday Edition Ugly Christmas Sweater parallel might be one of the coolest cards I have gotten so far. I caught the Wood Ducks home opener last Thursday (April 12) against Myrtle Beach, with my son and my brother. Myrtle Beach didn't have many guys with available cards that I could find in my boxes, so this was primarily a means to knock out some of my Wood Ducks cards before some scheduled 50/50s came in. I knocked out a lot of my Hickory team sets, and finished the Elite die cut Lemoine I had sitting since last year. 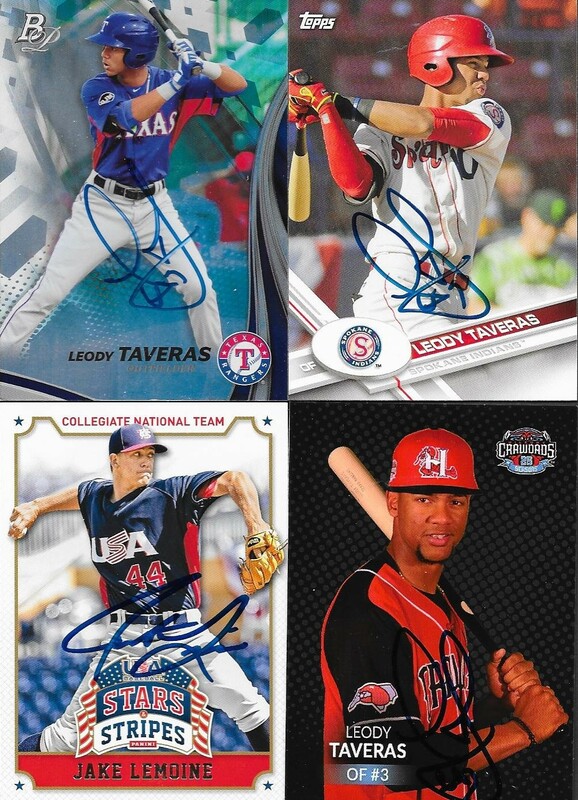 I did really well with Leody Taveras and Jake Lemoine. 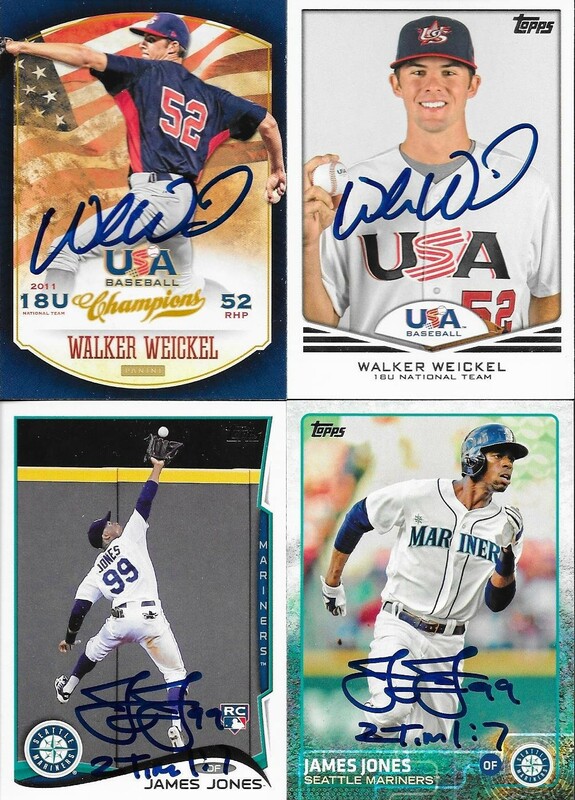 Anything else I get signed by them wil be either 50/50s or for trades because I knocked them out early. 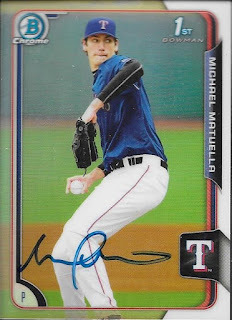 I had found quite a few guys at the Chantilly show, like the 2015 Bowman green refractor of Michael Matuella. The card looks really sharp. I have gotten everything signed by Matuella that I had built up over the off-season. I have learned that getting pitchers to sign is tough because they don't always come out of the bullpen onto the field before the game. 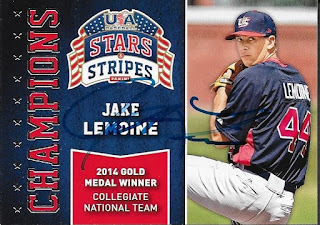 I can foresee that I will end up with extra Jake Lemoine cards by the end of the season, so I may hand off quite a few cards to kids at games. 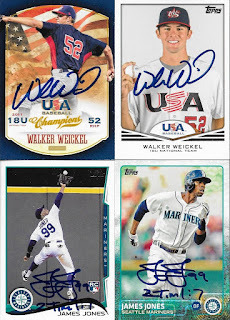 I had to buy Walker Weickel's cards off of Sportlots; I also had to bust two sets to get James Jones's cards that you see above. I found out that he was the former outfielder, so I searched my boxes for his stuff, to no avail. Luckily, my friend, Gerard, sent me some others for 50/50s, so I can replace the ones I removed from the sets. After the 4 games I have been to, Spike Owen already seems like he doesn't really like signing. I have gotten him on the cards that I especially wanted, so I doubt I will bother him much more throughout the season. 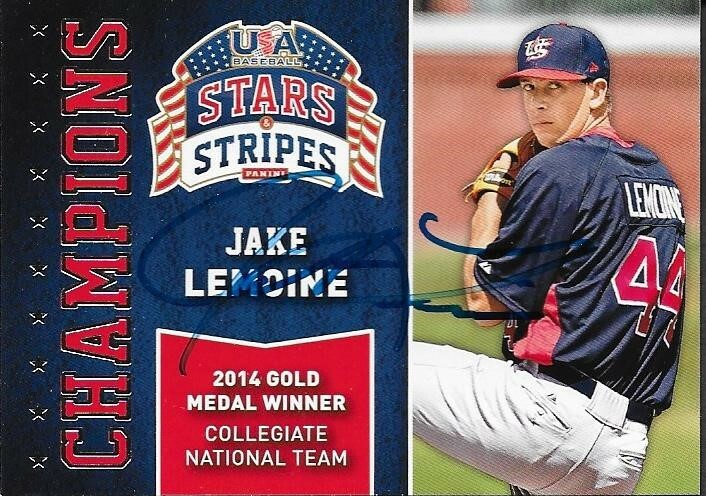 This Stars and Stripes Lemoine turned out really nicely, except the scan doesn't show the auto very well. I kept missing Blaine Prescott during the earlier games I went to, but I finally got him on Saturday. 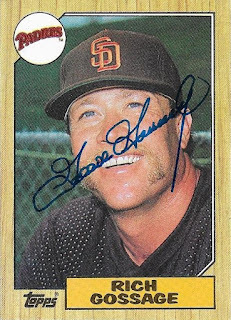 I completely missed Chuck LeBlanc in my Bowman box. Mainly because I was looking for Chuck and not Charles LeBlanc. He's a strict two-per, so I need a few more trips to the park to finish him off. I found the green Beras and Tejeda at the Chantilly show. It appears that was the theme of this series of graphing; green parallels. Finally, I only was able to get two Pelicans on cards. I tried to get Alex Lange, but he wouldn't sign. 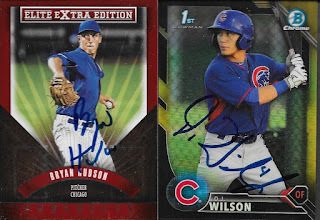 I found two of the Bryan Hudson and the one DJ Wilson at the Chantilly show in dime boxes. I was glad to at least get those done. 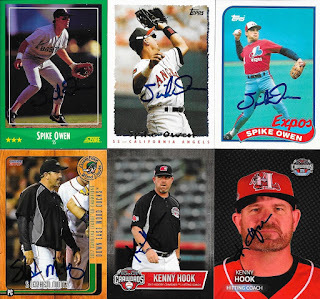 In all, during the Myrtle Beach Series, I got: Spike Owen x 8, Michael Matuella x 8, Jake Lemoine x 9, Alex Kowalczyk x 1, Leody Taveras x 8, Chuck LeBlanc x 4, Brendon Davis x 3, Jairo Beras x 2, Anderson Tejeda x 8, Blaine Prescott x 3, Carlos Maldonado x 1, Ricky Valencia x 2, Preston Scott x 1, Walker Weickel x 4, Christian Torres x 1, Steve Mintz x 3, Emerson Martinez x 1, James Jones x 2, Kenny Hook x 2, Jonathan Hernandez x 3, Jairo Beras x 2, Bryan Hudson x 2 and DJ Wilson x 1.